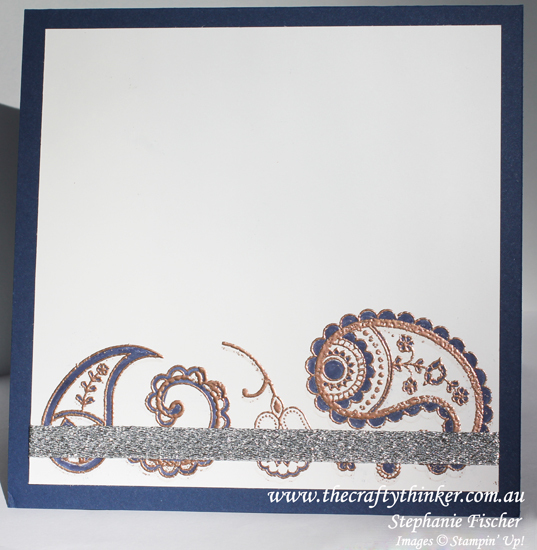 This card will be included in the Crazy Crafters Team Project Highlights this week - click here (from 6.30pm today AEST) to see all the wonderful entries and vote for your favourites. Stampin' Up! have really surpassed themselves with the new Holiday Catalogue - it's chock full of wonderful products! But, as you can see, the catalogue name may be a bit misleading because, whilst there are many beautiful Christmas and Halloween goodies, there are some fantastically versatile sets for everyday use too. The Paisley Petals suite is one of my favourites for its beauty and versatility: masculine, feminine, any occasion. For the card front I have used some of the Designer Series Paper and some of the matching dies and inside the card I used some of the matching stamps. 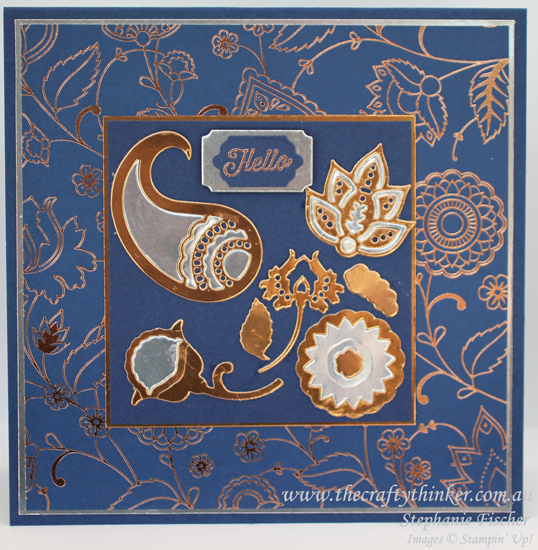 I used copper heat embossing to go with the copper leaf in the DSP and added some colouring with a Night of Navy marker. I added some of the new silver ribbon to tie the images together and bring in the silver element from the front of the card. I saved myself 10% by purchasing the stamps and dies in a bundle (143515). The products from the Holiday Catalogue will be available for sale from 1st September and the catalogues are out now. If you would like a catalogue, live in Australia, aren't a Stampin' Up Distributor and don't have a Stampin' Up Distributor - I'll be happy to send you a catalogue, just contact me.